Zachary’s 2nd birthday has come and gone. I am astounded I am now the mommy of a 2 year old boy! We had a very low key party for him, with just my parents, grandma, my best friend Amy (Z’s godmother) and our close friends Jason & Lu and their 3 month old baby daughter Lana. Zachary was showered with some amazing presents! He got a ton of Thomas/train stuff, an amazing train rug/playmat from GG, Toy Story stuff from Jason & Lu and Aunt Lissa from NY (who sent packages – we will see her next month though), clothes, and a very cool tool/building workshop from Aunt Amy. Gram Z and Grandpa Dan from TN got Zachary some early birthday gifts when we saw them about 2 months ago, which he’s already been loving, especially his tent and alphabet magnets! We also got some very sweet cards with gifts inside from other family members. It was so nice to spend time with our closest family members and friends. After a fun but hectic 1st birthday party, and the knowledge that his 3rd birthday will be hectic too, since he will want to have all of his friends, it was a relief to have the special people in our life with us to share our baby’s birthday and just enjoy the day. After everyone went home, Adrian and I sat with Zachary as he played with his new trains, and talked about what a great day it was. It sounds cliche to write that, but that’s just what we did. We looked over at our sweet little boy, who was loving his new toys, his new Thomas DVD, and thoroughly enjoying playing, and thinking about how great our family is and how lucky we are to have our Zachary. We fell asleep early that night after putting Zachary to bed. It was a great end to a a great day! There is a lot more that I could probably say about my little guy being two, but I think that paragraph kind of sums it up. I wouldn’t know where else to start. We are so happy to have our happy, quirky, adorable, funny boy. He is the most precious thing in the world to us. We are beyond excited because we know just how much he is going to grow and learn and change this year as he is on the road to turning 3 – and we can’t wait to find out just a little bit more of who he will become along the way. We love you, Zachary! Photos taken on Sunday, November 21st. Enjoying my #photofunmonth posts? Please vote on Picket Fence or Top Baby Blogs if you like my blog! 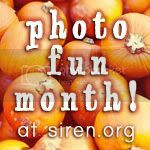 And don’t forget to check out the sidebar of the blog for my current Photo Fun Month giveaways! Sounds like such an awesome day! You look beautiful in these photos. Happy year 3 of mommyhood! Great pics! So glad he had such a good time. Look forward to seeing you all in a few weeks! He is so stinkin adorable. Next Post A beautiful day!